This tower, also known as the Red Tower www.redtowermalta.wordpress.com, was built in 1649 and was manned during both World Wars. It provides excellent all round views of Gozo, Comino and the Ghadira Nature Reserve. This Tower is situated on the crest of Marfa Ridge. A shallow alcove within the Tower housed a chapel dedicated to St Agatha. 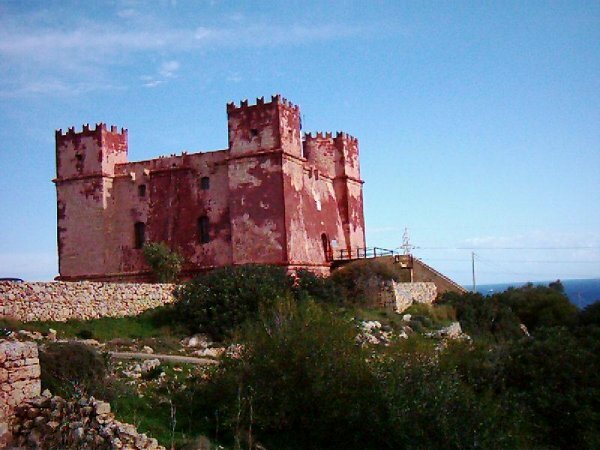 It is also known as the Red Tower due to the colour it was painted and this colour was retained on restoration. It was completed in 1649 during the rule of Grand Master Jean Paul Lascaris Castellar. This Tower was one of the main defensive positions during the time of the Knights of St John and was equipped with cannon and a garrison of 30 men, and supplied with enough food and ammunition to withstand a siege of 40 days. The entrance to the Tower is approached by a flight of steps originally separated from the door by a drawbridge. It is square in plan with four corner towers rising from the base. The outer walls are about four metres thick through which small windows were cut. A low star-shaped entrenchment serving as a gun platform built in the rear flanks of the Tower is an eighteenth century addition. During the British period it was used for defence purposes and was manned during both World wars. 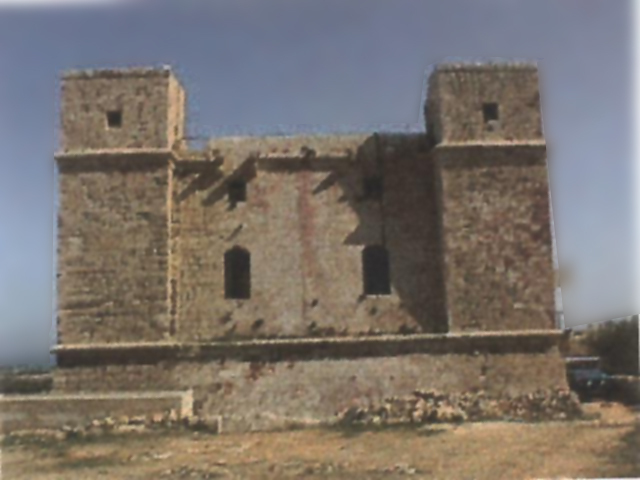 In recent times it was equipped as a radar station by the Armed Forces of Malta. The first phase of the restoration of the Tower was sponsored by Toly Products, the Demajo Group and Playmobil, and commenced in 1999 and was completed in 2001. One turret was missing and another turret severely damaged and its walls and roof were rebuilt and eroded stone replaced. The interior walls were scraped and painted and the original floor was uncovered. Due to the extreme unevenness of the floor, this was covered by a wooden surface with glass apertures through which it is possible to view the original slabs. An interior wooden spiral staircase was also constructed replacing a stone staircase which led to the flat roof and which had been removed. The roof commands magnificent views of Malta, Gozo and Comino.